A hand free waste disposal unit is ideal for many environments, not only is it more hygienic but it also allows for use when the users hands aren't free. 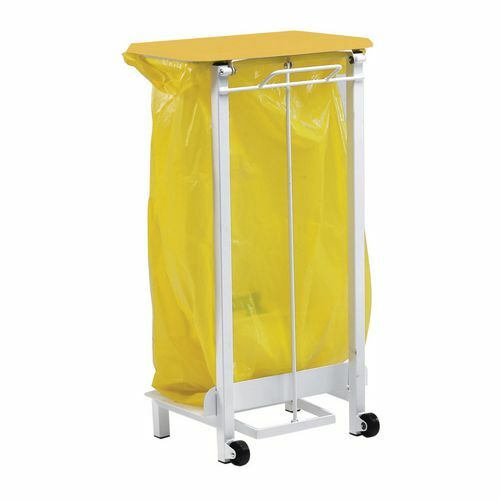 Our pedal operated sackholders are a great addition in workplaces where hands free disposal units are essential, such as healthcare and the food industry. They help reduce the chance of transferring germs or bacteria as the user has no need to touch the bin with their hands. Manufactured from top grade steel, these products have a long life and are durable. There are three sizes available; 17L, 92L or 127L, providing plenty of options allowing you to find the right one to meet your requirements. A choice of a free standing or mobile unit provides options for workplaces that require equipment that can be easily moved or one that needs to remain in one location. There's also a choice of lid colour allowing for multiple holders with different colour lids to be used to segregate waste. Our pedal operated sackholders are great hands free alternatives to traditional waste receptacles. They come with a 12 month guarantee for your peace of mind and FREE UK Delivery.